Our staff is committed to providing you and your pets with our very best care and service. As your pet’s veterinary health team, it is our duty help you understand your pet’s condition and to guide you in making the right choices for your pet’s well-being. While we will always present all appropriate options for diagnostics and therapies for a given condition, we need you to ask questions and to help us know your wishes for the extent of your pet’s care with us. It is our common goal to ensure a good quality of life for your pets within your means. We provide general medicine and surgical care for all companion animals, including dogs, cats, birds and reptiles, rabbits, ferrets, and “pocket pets” such as hamsters, gerbils, and hedgehogs. We perform the TPLO procedure for cruciate injuries in dogs as well as general orthopedic surgery for bone and joint injuries and soft tissue surgery for lumps/bumps/tumors. We provide full dental services for dogs, cats, and rabbits. We also offer acupuncture and Traditional Chinese Medicine therapies for certain conditions. We also now offer therapeutic laser treatment for acute and chronic conditions. At Scott G. Nachbar, Veterinarian, we treat your pets like the valued family members they are. Born and raised in Springville, Dr. Nachbar completed high school at Griffith Institute in 1983. He graduated from the College of Agriculture and Life Sciences at Cornell University in 1987 and from Cornell University’s School of Veterinary Medicine in 1991. He is continually renewed by the practice of medicine among the several species. Raised in West Seneca, Dr. Tyczka finished high school in 1982 at West Seneca East Sr. High. He graduated from Canisius College in 1986 and then from Cornell University’s School of Veterinary Medicine in 1990. 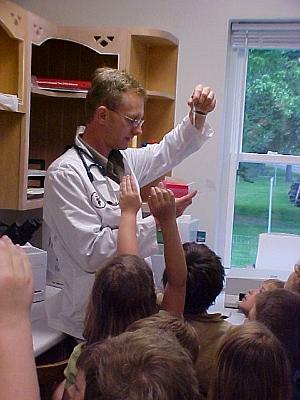 He performed a post graduate internship at the Western College of Veterinary Medicine in Saskatchewan, Canada. Dr. Gugino is a recent graduate of the Ontario Veterinary College at the University of Guelph. She has a strong interest in wellness, internal, and alternative medicine. She is certified by the College of Animal Chiropractors. She is working on restoring an old farm house in Eden with her husband Matt and Am Staff puppy Watson. Dr. Gugino enjoys working outside, skiing, horseback riding, and spending time with family. Danielle has over 20 years experience in veterinary office management and assisting. Dani holds a certificate in Office Management from the American Animal Hospital Association. She has an amazing son that keeps her busy. She enjoys four-wheeling and camping with her family, friends, and dogs. Kelleigh graduated from Medaille College in 2006 with an AAS degree in Veterinary Technology. She is also a certified Equine Sports Massage Therapist, and Outdoor Emergency Care Technician, and a member of the Holimont Ski Patrol. She keeps busy training and competing 3-day event horses, and giving riding lessons. Cynthia has a BA from Purdue University in Veterinary Technology and an AAS degree in Veterinary Technology from S.U.N.Y. Alfred. Cynthia keeps busy with her two daughters, and spending time with her family, friends and pets. Kelly has an Associates degree in Animal Science from S.U.N.Y. Alfred and a license in Veterinary Technology from NYS. Kelly keeps busy with her 4 children, and enjoys camping, hiking and outdoor activities with her family and dog, Zura. Heather holds an AAS degree in Veterinary Technology from Alfred State College as well as an AAS degree in Equine Science and Stable Management from SUNY Morrisville. She enjoys spending time with her husband and two children on their small hobby farm. Melissa has an Associates Degree in Zoo Animal Technology from Santa Fe College Teaching Zoo in Gainesville, FL. She keeps busy with animal training, volunteering at Hawk Creek Wildlife Center, and enjoying her selection of pets. "Dr. Nachbar is the best. We drive 45 minutes from Buffalo for our dachshund because we trust him more than anyone in the city. The services are affordable, scheduling flexible, and the appointment personal. I would, without a doubt, encourage your patronage of this fantastic practice." "Dr. Nachbar is just fantastic. He makes time to see our crew, and is always available for emergencies. I have recommended Dr. Nachbar to everyone that I know!!! Even Dani and all of the Techs are wonderful. I highly recommend Dr. Nachbar and his practice to everyone. He certainly goes above and beyond in his care for all of our critters, and it shows." "I used Dr Nachbar for many years to care for my Dogs, cats and Parrot. Competent, kind, thoughtful, communicative are just a few of the adjectives I would use to describe him. The care my animals received was always top notch. I trust him far more than my human care providers. :) do not hesitate to select him as your veterinarian!" "Can't thank everyone enough! So very helpful with the myriad of pets we have. Everyone goes the extra mile, literally, to take care of this houseful of fur babies." "We had our first visit for a wellness checkup for our Sun Conure and had an amazing experience. The staff was extremely friendly, supportive and most of all loving towards our new addition, Beaker. They took us on time, answered all of my questions and even provided me with support materials to take home. Highly recommend, especially for special case pets." "Friendly staff and excellent care for your pets." "He is a very kind and gentle vet to your pet who really cares . His surgery abilities are phenomenal." "Just switched from another vet and I am impressed. Dr. Gugino was awesome. She's very smart and thoughtful. She diagnosed and treated Zeus, my dog, when no one else could . The staff is very pleasant and knowledgeable." "Nice vet takes the time to care for your pet needs and definitely has an excellent staff for support." "Dr Nachbar & Dr Tyczka and staff take such good care of our hamsters. I couldn’t have asked for a better veterinarian. I would give them 100 stars if I could." "We had our first visit there today, I've been searching for a new vet after a very bad experience. Our dog is usually fearful and growly at the vets, but at Dr. Nachbar's she was wagging her tail and eating treats. The staff is exceptionally kind and caring and went out of their way to make her feel comfortable. I will be singing your praises!" "I've brought my dogs here for years. It began with a surgical referral from someone who took over my original Vet's practice. My girl never had the surgery because it was deemed unnecessary and she lived out a great life to the age of 14 under Dr. Nachbar's care. After that first visit, I pulled both my dogs out of the care of the previous provider and have been a faithful client ever since. The expertise, the education and the love of his work sets Dr. Nachbar far above the rest. I recommend this Vet 100%." "I love Dr Nachbar! He's been our vet for at least 16 years. Always compassionate and always listens to you." "Dr. Nachbar and his girls are the best. They take such good care of my little dogs and care how I feel about what is going on with them. They are so friendly and helpful in any situation I have had. I would recommend them to anyone with dogs that are part of your family." "After years of seeing different vets with different dogs I can honestly say Dr. Nachbar DVM + his new associate Dr. Gugino DVM are absolutely the best vets I've ever taken my dogs to. They genuinely care about their patients + owners. They take the time to put you at ease, answer all your questions + concerns. The first time I took my 2 Labs to Dr. Nachbar, I thought where have you been my whole life !!!! They work with traditional + homeopathic treatments. In my opinion, Nachbar veterinary clinic in Springville, NY is without a doubt the best place in our area to take your animals sick or healthy!!!!" "Dr Nachbar is up to date on newer trends in veterinary medicine, including reduced vaccination schedule, acupuncture, chiropractic, Chinese medicine as well as traditional veterinary practice." "One of the nicest vets I've ever had. Kind, caring, and compassionate. I'm currently in school to be a Vet and I hope to be as great and work at an office as kind and amazing as this one." "Dr Scott has taken care of my dogs since day one. Him and his staff are very caring and compassionate with every animal that comes in their office." "Above all the rest, Dr. Nachbar is the best!" "Our family pet , Buster suffered a torn ligament in his knee. Dr. Nachbar and his staff not only repaired his knee but did it faster and at a better price than any of the other local animal hospitals in this area. We are thankful for the efforts of the hospital and intend to transfer all three of our animals over to Dr. Nachbar for future care."